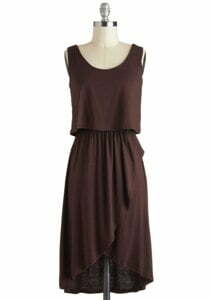 What is the color chocolate brown and what matching colors you can wear with it? This is a deep, calm and full of shade, which emphasizes the sense of style and good taste in clothes. Dark brown gamma is associated with the traditional people. But, moreover, chocolate brown is one of the most precious shades. It gives the impression of simplicity, confidence and peace of mind. Chocolate brown does not create a visual barrier to communication, in contrast to the black, so is one of the recommended colors for things every day. In addition to the daily, chocolate color is perfect for evening bows. Dress this tone in combination with precious metals, stones or pearls looks really luxurious, it is associated with prosperity and stability. Chocolate brown color is classified as neutral shades. It is able to be matched with virtually any color. Vibrant and bright colors set off the chocolate. With dark looks great, too, but in this case it is necessary to make sure that the color combo has not turned grim. Differ in brightness variations additions to the chocolate would be appropriate for different occasions. So the combination with shades of complementary white, blue, pale lemon, beige are most often used for formal way, look at the photos. This decision, coupled with classic style allows a woman to look strong, competent, but at the same time open to dialogue.